I have always considered myself to be a Samuel Johnson/Mary Hyde Collector. But now I see quite a few books by or about James Boswell on my library shelves. So maybe I have become a James Boswell Collector as well. One book I can't wait to add to my library is Boswell's Books, soon to be published by my friend Terry Seymour. His book is a study and a catalogue of books formerly owned by James Boswell (1740-1795) and other members of his immediate family. 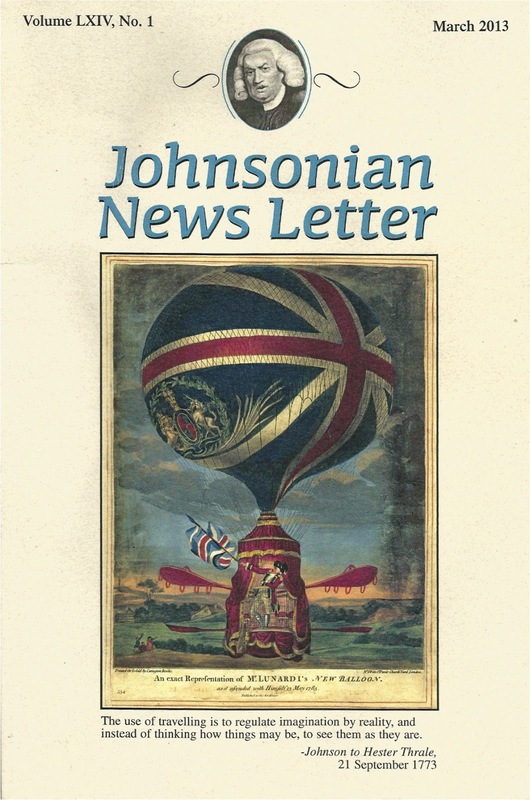 And just to entice us, Terry wrote "An Appendix to Boswell's Books," an article which appeared in the March 2013 issue of the Johnsonian News Letter (JNL). But Terry Seymour's JNL article caused me to recatalogue the Boswell Library on Library Thing. Yes. I am no stranger to Boswell's books, having spent almost four years cataloguing them. In October 2008, I invited Dave Larkin, a booklover from the Cape Cod area, to help me catalogue James Boswell's library. Dave had previously invited me to help him catalogue Samuel Johnson's library on Library Thing. Joining us was Anna Ritchie, a Scottish lass who was working in the Netherlands. 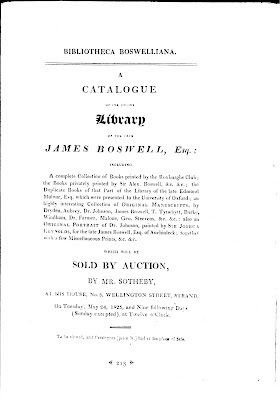 The catalogue we would use, Bibliotheca Boswelliana, was part of the Sale Catalogues of the Libraries of Samuel Johnson, Hester Lynch Thrale (Mrs. Piozzi) and James Boswell With an Introduction by Donald D. Eddy, Oak Knoll Books, New Castle, Delaware, 1993. My copy of this work was a set of unbound sheets, which was perfect for scanning parts of the 1825 catalogue and sending them to Dave and Anna in PDF files. 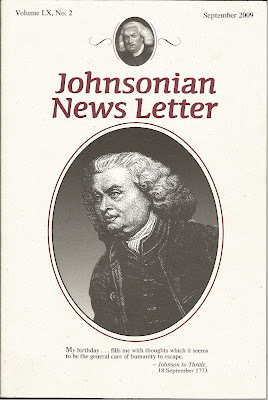 Dr. Johnson advised me to-day, to have as many books about me as I could; that I might read upon any subject upon which I had a desire for instruction at the time. "What you read then (said he) you will remember; but if you have not a book immediately ready, and the subject moulds in your mind, it is a chance if you again have a desire to study it" (Life III 193). Immediately below the quote, Eddy wrote: "The following catalogue shows that Boswell heeded Johnson's advice remarkably well." 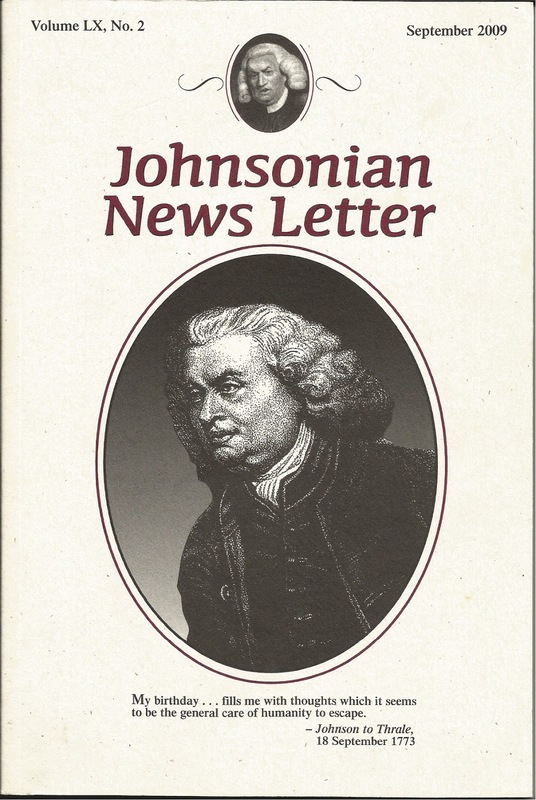 James Caudle, Associate Editor of the Yale Editions of the Private Papers of James Boswell, read my announcement in the JNL –– and probably chuckled! But in the weeks, months, and years to come, James Caudle would supply me with real catalogues of James Boswell's library; enough catalogues which, in Dave Larkin's words, "would keep us busy for the next fifty years." It took us thirteen months to catalogue the books listed in the 1825 Auction Catalogue. 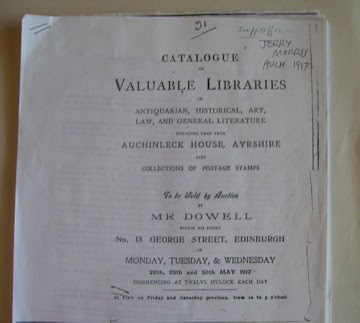 It took us another thirteen months to catalogue the books listed in the 1893 Auchinleck Sale Catalogue. It took me two months to catalogue the books listed in the 1810 Catalogue of Greek & Latin Classics in the Auchinleck Library. 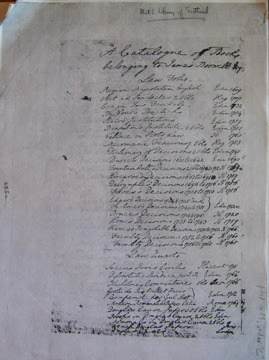 It took me six months to catalogue the books listed in the C1770 Catalogue of Books Belonging to James Boswell Esq. 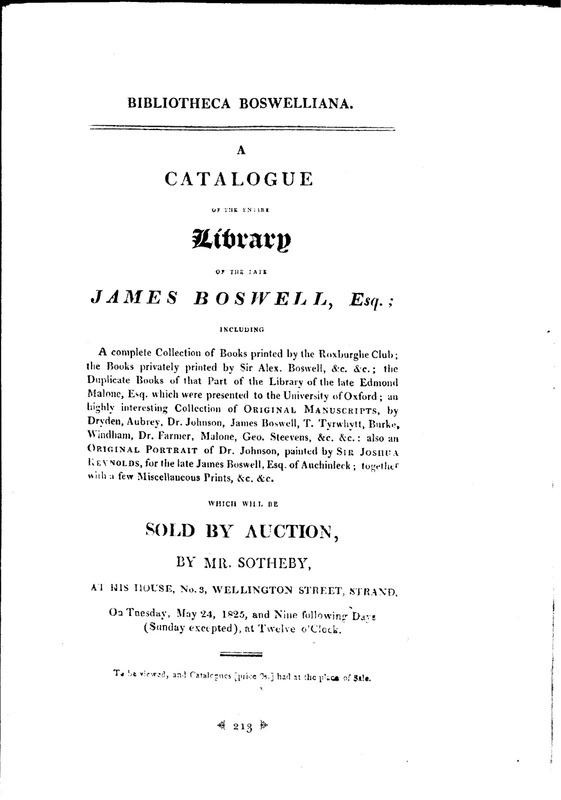 It took Dave Larkin eight months to catalogue the Boswell books listed in the 1916 Sotheby Sale. 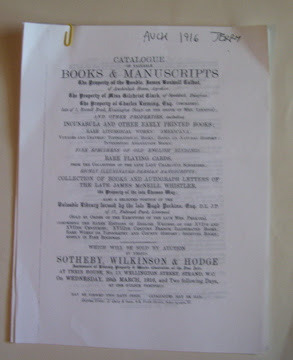 It took me six months to catalogue the Boswell books listed in the 1917 Dowell Sale. On August 30, 2012, after cataloguing Boswell's Curious Productions (chapbooks), I declared the cataloguing of the Boswell Library complete. And yet, I was recataloguing Boswell again this month! You see, the appendix that Terry included in his JNL article was a detailed listing of all 290 entries of the 1810 Catalogue of Greek & Latin Classics in the Auchinleck Library. When I catalogued the 1810 Catalogue on Library Thing in 2011, I only came up with 279 entries. So this month I counted each entry in the catalogue James Caudle gave me and, sure enough, there are 290 entries. And after a day and a half, I found and catalogued the entries I missed the first time around. I have to say I am proud of our achievements in cataloguing the Boswell Library on Library Thing, and even enjoyed recataloguing it again. But one thing that frustrated me, particularly when cataloguing the 1893 Auchinleck Sale, was the number of books that were not listed by title in the lots, but which were represented by that dreaded phrase, and others. By my count there were at least 436 books not listed by title in the 1893 Auchinleck Sale. Terry Seymour's book, Boswell's Books, will include many of the books listed under and others. Terry went one step further, acquired the bookseller catalogues of the purchaser's of the 1893 Auchinleck Sale lots, and identified books that were not listed by title in the auction. And to sweeten the pot even more, Terry traced the provenance of many of the books, from the auction and bookseller catalogues to their current location in institutional and private libraries. Take a bow, Terry! Yes. I can't wait to add Boswell's Books to my library.